Communicator. Project Manager. Scientist. Creative Thinker. LOVE WINS. Bloody well done everyone who campaigned, voted and to all my LGBTIQ+ fam and friends. Now let's get this legislated! Australia’s Department of Foreign Affairs and Trade (DFAT) lacks a strategic framework for its investments in development research and has very little central institutional capacity to guide research or ensure its outputs are well used, a recent evaluation has found. “[DFAT] needs to invest more in coordinating and capitalising on the results of research,” said John Young, head of the Overseas Development Institute’s (ODI) Research and Policy in Development Programme and co-author of the evaluation. The evaluation draws on interviews from 173 DFAT staff and external stakeholders to determine whether DFAT’s development research investment has been appropriate, effective and efficient. Research can contribute to innovation in development and improve aid policy and programming. From 2005–2013, Australia’s investment in aid research ballooned from AU$19 million per year to AU$181 million per year (around 3% of the total aid budget, which is similar to most other government aid programs). 60% of this funding is invested in a handful of Australian organisations and researchers. The evaluation focuses on the uptake of research by DFAT itself, rather than, for example, developing country governments. According to Young, this was due to the limited resources available for the evaluation. “It’s really a process evaluation of the way in which DFAT commissions and uses research…one can search the report in vain for any sense of the nature and impact of even the largest research investments,” said Robin Davies, associate director of the Development Policy Centre. The evaluation was commissioned by Australia’s aid agency (AusAID) where there was “quite widespread support for research across the agency,” Young said. Though poorly resourced, AusAID had a specialised research section, which maintained a central database, assisted staff to commission research, and ran development research awards and systematic reviews. Several months into the evaluation, a change in government saw AusAID absolved into the foreign affairs department and the 2012-2016 research strategy discontinued. “They actually closed the research section down and from that point on, the whole tone changed,” Young said. Aid research investment in DFAT is largely decentralised, with 97% being directly managed by individual country and thematic programs. Unlike AusAID, the divisions that manage the aid program also cover trade and diplomacy interests. When aid is closely aligned to trade and diplomacy programs, problems can arise. Short-term research focused on specific programs has been favoured and better used compared to longer-term, policy-related research, the evaluation said, despite a 2011 Independent Review of Aid Effectiveness recommending that Australia do more to support global research efforts. “One year research projects are useful in informing programs but not really useful in terms of understanding what could reduce poverty, for example. You really need to be looking at three to five year agendas and long term partnerships,” Young said. Developing country researchers receive the lowest levels of funding compared to Australian and international researchers, the evaluation found. Some funding to developing countries is channeled indirectly, for example through secondary partnerships, grants and commissions by the Australian Center for International Agricultural Research (ACIAR). “The unstated primary objective [of Australia’s aid research program] to date has really been to provide incentives for Australian research institutions to build and maintain expertise on the problems of our region,” Davies said. This situation is somewhat out of line with policy statements on improving partner capacity, the benefits of local research to partner government decision-making and ensuring locally appropriate research designs. The PNG Institute of Medical Research (PIMR) is one of DFAT’s largest direct research funding recipients from the developing world, receiving AU$10 million specifically earmarked for capacity building activities, such as training of clinical staff for data collection in the field. 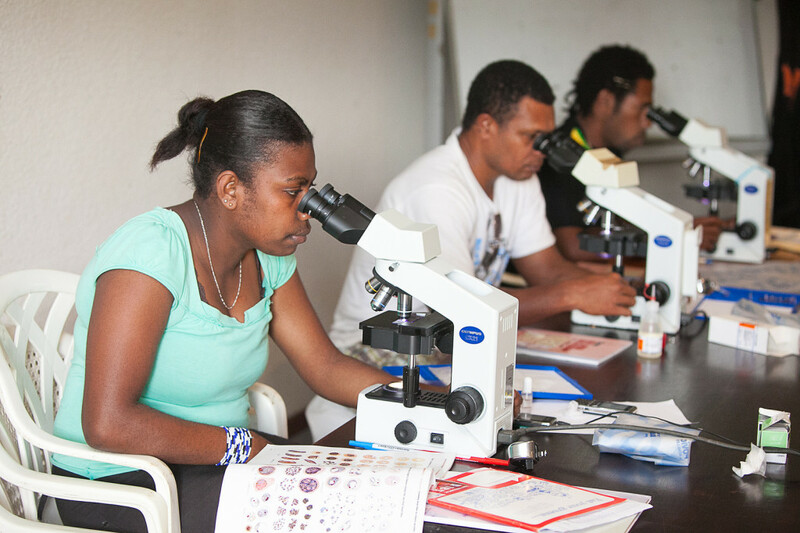 “If they could build capacity of local researchers to really [improve] writing and sourcing of external funding then, in the long run, there’s a bright future for PNG,” said Steven Aina, administrator of PIMR’s sexual and reproductive health unit. Increasing the availability of competitive tendering within projects and programmes is one way to create opportunities for new researchers to enter the market, the evaluation suggests. The report’s main recommendations include resolving governance and coordination issues, increasing managers’ demand for research-based evidence and investing in workforce planning and training to improve research uptake and ‘knowledge brokering’. While DFAT’s management response claims to have accepted many of the report’s recommendations, “there is no indication [they] will adopt a strategic approach to supporting public-good research, or research on development challenges which cut across a number of countries,” Davies said. Australia’s aid budget is set to drop by AU$1 billion in the next financial year. It is unclear what impact this will have on aid research. “We have seen the quiet axing of the Australian Development Research Awards, uncertainty about future funding for health-sector product development partnerships, the closure of the knowledge hubs for health, and the likely downsizing of country-specific initiatives,” Davies said.